Tennessee football coach Jeremy Pruitt shouts as the Vols warm up for the Orange and White spring game Saturday at Neyland Stadium. KNOXVILLE — Perhaps no other position group on the Tennessee football team took as many positive strides during spring practice as the offensive line. Yet there's perhaps no greater indictment of the quality of last season's line unit than the fact that, after 12 practices, two closed scrimmages and Saturday's Orange and White game, there's still a long way to go. If there's a bright spot, it's knowing that while last season's unit was patchwork and this spring mostly has been a continuation, with largely the same players, there's been improvement and reinforcements are on the way. 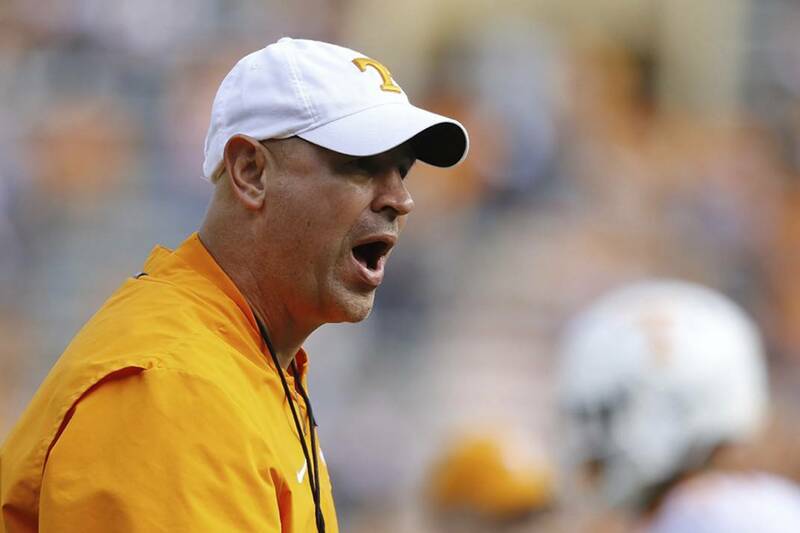 Head coach Jeremy Pruitt said Saturday's performance wasn't any better — or worse — than anything he'd seen up to the spring game. "It was probably similar," Pruitt said. "We have more guys that have an opportunity to contribute right now than we had last year, but we've got to learn to compete harder. We have to play with better pad angles, we have to be lower with our bodies, we've got to take the correct steps, and we've got to be finishers. We've had some better days than others. "But I think that we have guys up front that, if they will challenge themselves and look themselves in the mirror every day, that they go out there for the next 12 weeks they work hard and improve. You can do a lot as an offensive lineman by yourself. They put dummies on those sleds every day. Whether you're going to take a zone step or a stretch step or going to work a double team, you can do all of that on your own, and we need guys to do that. They need to have pride in their performance and go work hard this offseason. We need a really good offseason at every position. We have some guys that need to improve their strength, and I think Craig (Fitzgerald) and Rachel (Pfister) have done a really nice job in this offseason and in this last year, so I don't think that will be an issue moving forward." The push for improvement has had to come from offensive line coach Will Friend as well as the players themselves. Injuries caused the early retirements of Chance Hall and Tanner Antonutti. A knee injury took all but one game from senior Brandon Kennedy, who has been limited during the spring. Trey Smith, a starter in 2017, has participated only in individual drills as he works his way back from blood clots that have have threatened his future and likely will continue to. The Volunteers brought in five offensive linemen during the 2019 recruiting cycle. Chris Akporoghene and Wanya Morris enrolled early and went through the spring, while Jackson Lampley, Melvin McBride and Darnell Wright will join them soon. Last season's injury to Kennedy caused a reshuffling of the line, which at one point led the coaches to "pray no one else got hurt." As a result, the spring has been spent building and developing consistency in the bodies they have, as well as developing some versatility. For one thing Jerome Carvin, who primarily has played guard at Tennessee, has been cross-trained at center behind Kennedy and Ryan Johnson, who moved from guard to center after the injury to Kennedy. "We've been up and down," Friend said last week. "We've had a couple of good days. We've improved from this time a year ago; we're stronger, more physical, more mature than we were a year ago, but there's still a long way to go. We're not consistent enough; we need to be more consistent on a day-to-day basis. When you have a good group up front, that's the one thing you can count on is consistency. "No matter how talented you are, no matter how physically imposing you are, if you're consistent you have a chance. That's what we're fighting now."